Welcome to the final blog post in our “Advanced Load Testing” series. This time we will go over how to configure the Stepping Thread Group and the Concurrency Thread Group. The Stepping Thread Group and the Concurrency Thread Group are convenient and stable ways to find out how much user capacity your system can handle. By adding users in steps, we know the exact number of virtual users tested when a bottleneck is discovered. If we test in a linear fashion, it is difficult to determine the precise number of users that causes issues in the system. The Stepping Thread Group lets us create ramp-up and ramp-down scenarios in steps. - Decrease load by portions. First, install Customer Thread Groups from the JMeter Plugins Manager. Then, add the Stepping Thread Group from the Test Plan. - Finally, 10 threads are stopped every 3 seconds. - The test begins immediately when JMeter starts, since there is 0 seconds waiting. - Every 30 seconds 100 users will be added, until we reach 1,000 users. The first step is 1-100, the second 101-200, etc., because we defined 0 threads to run at the beginning. If we defined 50 threads to run the first step would be 51 - 150, the second 151 - 250, etc. and the test would be completed faster. - It will take each of the steps (with 100 users each) 10 seconds to complete. After that JMeter waits 30 seconds before starting the next step. - After reaching 1,000 threads all of them will continue running and hitting the server together for 5 minutes. - At the end, 10 threads will stop every 3 seconds. 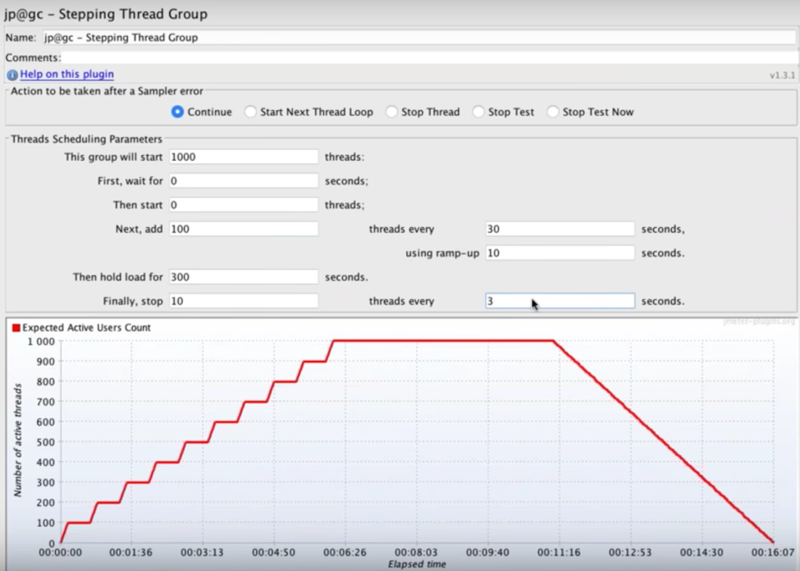 The Stepping Thread Group shows us the test in a real-time preview graph. By changing the values, you can ramp-up the load to monitor your server metrics. Now you're ready to launch the test. Consider adding the Active Threads Over Time graph for tracking your load schedule’s performance and making sure it’s running as expected. Using the Stepping Thread Group on BlazeMeter requires slight configuration. For more information see here. You can also use the Concurrency Thread Group, which is a more modern alternative to the Stepping Thread group. 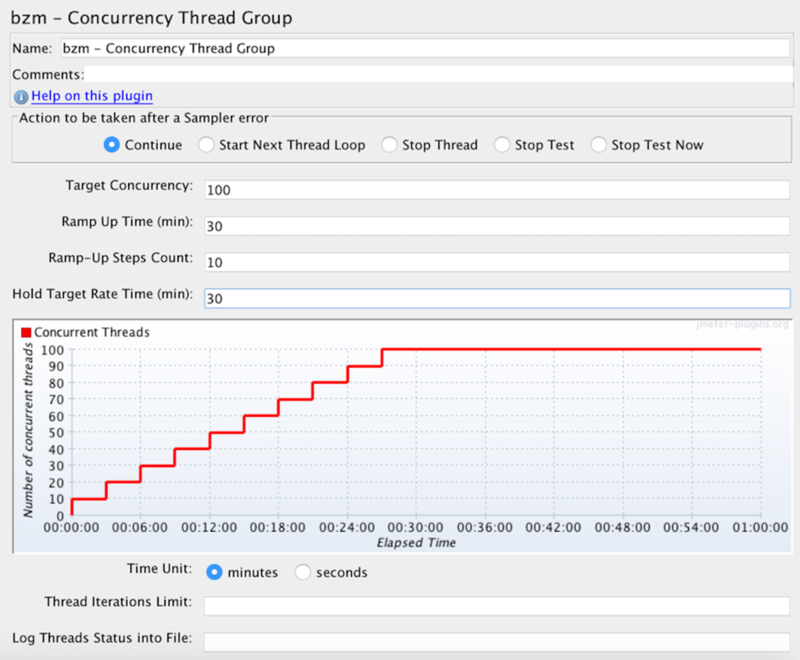 The Concurrency Thread Group provides a better simulation of user behaviour because it lets you control the length of your test more easily, and it creates replacement threads in case a thread finishes in the middle of the process. In addition, the Concurrency Thread Group doesn’t create all threads upfront, thus saving on memory. The Concurrency Thread Group doesn’t provide the ability to define initial delay, step transition and ramp-down - which the Stepping Thread Group does. Add the Concurrency Thread Group from the test plan. - Every 3 minutes 10 users will be added until we reach 100 users. ( 30 minutes divided by 10 steps equals 3 minutes per step. 100 users divided by 10 steps equals 10 users per step. Totalling - 10 users every 3 minutes). The Concurrency Thread Group also shows us the test in a real-time preview graph. Now, record the script and run the test. Congratulations! You are now ready to use both the Stepping Thread Group and the Concurrency Thread Group. Check out this free webinar about Advanced JMeter Scripting and Continuous Integration Performance Testing, here.